This card is your official University ID, and should be carried with you at all times. The SUU T- card is a photo card and is to be used only by the person to whom it is issued. It is not to be loaned to any other person for use and is subject to confiscation if found in the possession of another person. 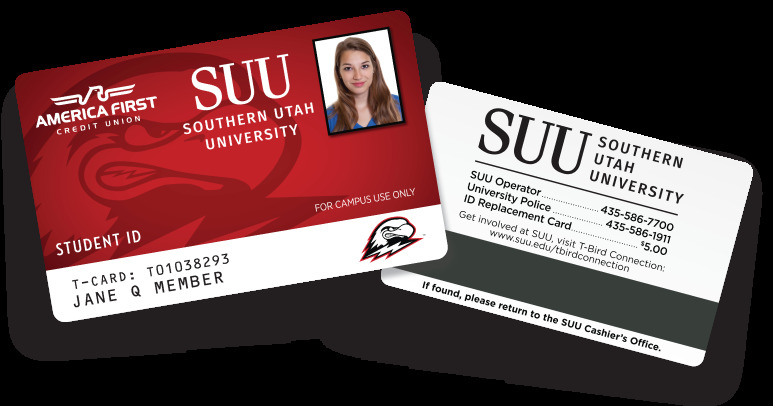 DO NOT mutilate the SUU T-card or change any of the information on the T-card. Any misuses will result in a $5.00 charge to replace the ID. The University is not responsible for any loss or expenses resulting from the loss, theft or misuse of this card. If found, please return to the Cashier's office, Sharwan Smith Student Center 165. Old or damaged cards must be surrendered to the Student Involvement and Leadership office prior to issuing a replacement card. Who gets an SUU T-Card? Where can I get an SUU T-Card? Student, Faculty and Staff ID’s can be requested on campus in the Student Involvement and Leadership office, Sharwan Smith Student Center 177. Students can receive a new T-card after an academic year. Example: If you received your first T-card Fall semester 2017, you can receive a new T-Card Fall 2018 without a fee. If you need to replace your Student ID within the academic year, a $5.00 replacement fee must be paid. This fee is paid at the Cashier’s office and a receipt brought to the Student Involvement Office to show it has been paid prior to receiving the new T-card. Full-time faculty and staff receive an ID when hired. If the SUU Faculty/Staff ID card is lost or needs to be replaced, a $5.00 fee must be paid. This fee is paid at the Cashier’s office and a receipt brought to the Student Involvement Office to show it has been paid prior to receiving the new ID. This process is only available to First-Time SUU Students. Current or returning students should visit the STIL office in ST 177 to request a T-Card. Go to the Student ID page in your My SUU portal, where you will need to upload a photo of yourself. Your photo should be a current color photo of you. A plain, neutral colored background is preferred. Centered and front view of full face. Cropped from just above the top of the head to the collarbone. Not full body. Wear prescription glasses if you normally do so. Maximum photo size of 3200 x 3200 pixels. JPEG, GIF and PNG are supported. Don't wear hats, sunglasses, or other items that obscure the face; glare on glasses; shadows; other visible people or objects in the photo; inappropriate expressions. All photos are subject to approval. No copyright pictures will be allowed. Once a profile photo has been uploaded you will be able to request your SUU T-card. On-campus students can pick up their requested T-card in the Student Involvement and Leadership office, Sharwan Smith Student Center 177. Off-campus students, choose the address you would like your T-card sent to, or enter a new address. Once you have selected an address, the SUU T-card staff will process your request and mail your T-card to the address specified. You will receive an email notification when your T-card has been sent. What does SUU do with the photos? To be used for faculty roll, portal and canvas purposes. To comply with applicable laws, regulations, and lawful orders and requests to produce the photograph, upon direction and approval from the Office of Legal Counsel. 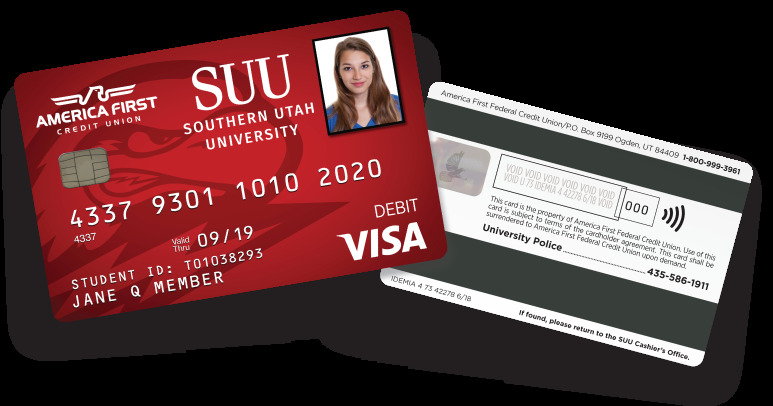 Southern Utah University & America First Credit Union are bringing you the all-in-one solution for identification, campus access, and debit purchases. When you use the Visa, funds come directly from your America First checking account. Plus, it works at ATMs, it’s convenient and it’s secure. Visit America First Credit Union's website to activate yours today—the only card you'll ever need during your college experience.